My bookselling days are long over, but I well remember the lavishly decorated book carts we used to unload new books, shelve them, and then pull them off for returns. Publishers sent copious amounts of promos to the store - postcards, gadgets, stickers and all kinds of bells and whistles - all of which eventually made their way onto those all-purpose carts, most often in ways never intended by their creators. Happy but sad news: Bill Barnes and Gene Ambaum, our good friends at Unshelved, have begun the Ultimate Pimp My Bookcart contest "to see who can best pimp, trick out, or otherwise improve a standard book cart." But this is the ultimate contest in more ways than one: it will be the last. 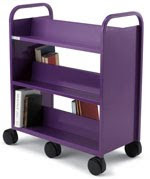 Any library, school or bookstore or other organization with a book cart is eligible to enter. The first, second and third prizes are provided by Smith System. Runners up receive gift certificates to the Unshelved store. And for the best cart made just by kids middle-school age and under, each participant receives an Unshelved book and T-shirt. Deadline for submissions is November 15. Bill and Gene will judge the winners. For more information, go to unshelved.com/pimpmybookcart. Makes me wish I still had access to one.